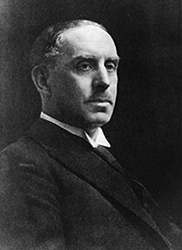 Charles Glover Barkla was a physicist at Edinburgh University, specializing in atomic physics. He was awarded the Nobel Prize in Physics in 1917: "for his discovery of the characteristic Röntgen radiation of the elements." June 7, 1877Birth, Widnes (England). 1898Obtained Honors in Physics degree, University College Liverpool, Liverpool (England). 1899Obtained Masters degree in Physics, University College Liverpool, Liverpool (England). 1899 – 1900Researchers under research scholarship, Cavendish Laboratory, Cambridge (England). 1900 – 1902Oliver Lodge Fellow, King's College, London (England). 1905 – 1909Demonstrator (1905); Assistant Lecturer in Physics; and Special Lecturer in Advanced Electricity (1907-1909), University College, Liverpool, Liverpool (England). 1909 – 1913Wheatstone Professor of Physics, University of London, London (England). 1913 – 1944Chair in Natural Philosophy, University of Edinburgh, Edinburgh (Scotland). 1914Fellow, Royal Society of Edinburgh. 1918Awarded Nobel Prize in Physics “for his discovery of the characteristic Röntgen radiation of the elements. October 23, 1944Death, Edinburgh (Scotland). Advised by Barkla at University of Edinburgh. Advisor at University of Liverpool. Advised by Barkla at Cambridge University. Obtained Honors in Physics degree (1898) and Masters degree in Physics (1899). Demonstrator; Assistant Lecturer in Physics; and Special Lecturer in Advanced Electricity.